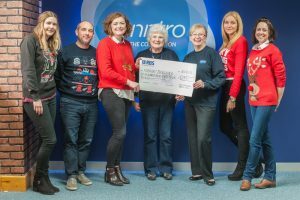 A HUGE thank you to Venntro Media Group Limited in Windsor who raised over £650 for the branch by running cake sales and dressing up for Halloween. In the photo from Venntro – Emma Bullen, Sam Barnes, Hannah Flaherty, Libby Caton and Rachel Sheppard and in the middle, receiving the cheque on behalf of East Berks RSPCA, Gill Cuff and Wendy Frampton. Thank you to everyone who took part, the money will help tremendously towards the care of the cats and dogs in the branch especially over the cold winter months.